I've not added a new bird to the patch year list since the 28th May (Reed Warbler) and I wasn't expecting to add anything new this weekend, but a rare mid-summer visit reaped a small reward in the shape of a Common Tern - It caught me totally off guard (hence the poor photo below) as it quickly flew low and without calling over Alexandra Lake. 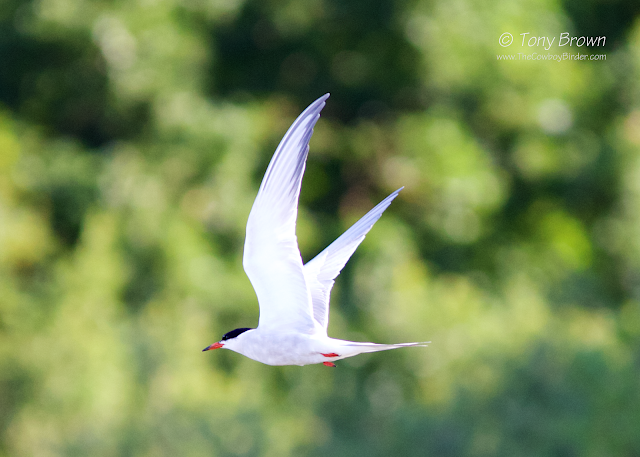 In previous years I can typically add Common Tern to the year list with a visit to Wanstead Park, with one or two birds knocking around the waters - but as yet this hasn't been the case, which makes ticking a bird on the Flats a real bonus. That's 89 for the Year List with a couple of glaring omissions still to add - Yellow Wagtail and Siskin, and with autumn just around the corner, there'll hopefully be a few more goodies on the horizon to keep me on track of breaking that century count for the year.